CorporateHistory.net | A. W. Hastings & Co.
Our book is about business and products and all of that, but it’s more about people. The creation of the book was a really neat experience and I genuinely enjoyed Marian’s intelligence, wit, good humor, and especially her patience. I keep a box of books in my office and frequently give them away to business associates and visitors. It really gives great insight into who we are. Family businesses have special reasons to celebrate their past. By leaving a record, they ensure that future generations will fully understand the personalities, values, and turning points that shaped the company’s success. That record need not be a lengthy book. For smaller and regional firms, a concise, elegant keepsake publication may be the answer. 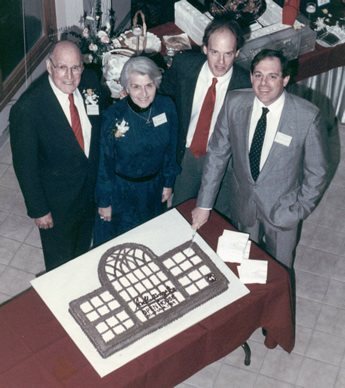 A. W. Hastings & Co., Inc., one of New England’s oldest window and door companies, has been in the hands of just two families during its 160-plus years. Hastings commemorated its history in an illustrated 80-page paperback that reflects the high quality and Yankee heritage for which the company is known. Part of the joy of creating this book was the opportunity to preserve the memories and insights of the 93-year-old former CEO, Ivan K. Hoyt, and former treasurer Florence Hoyt, parents of the current company leaders. 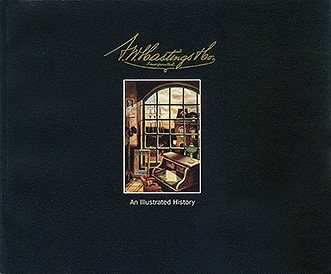 Award Winner: A. W. Hastings: An Illustrated History won an Apex Award of Excellence for custom publishing. Sponsored by Communications Concepts, Inc., these awards are based on the quality of graphic design, editorial content, and communications excellence. The competition drew almost 5,000 entries, with just 52 winners in the custom publishing category. The painting on the cover is by New Hampshire artist Chip Evans. Commissioned for the book, it depicts Hastings’s Boston offices in the era of clipper ships. Evans created large reproductions in beautiful wooden frames, which the Hoyts gave as gifts to key customers. The artwork was also used for company notecards. Ivan, Florence, Jody, and Dusty Hoyt at the Enfield headquarters opening in 1988.